This issue of Child and Adolescent Psychiatric Clinics, edited by Drs. 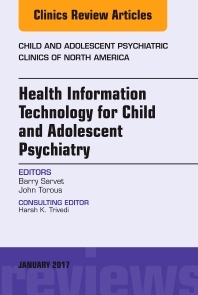 Barry Sarvet and John Torous, will cover the spectrum of Health Information Technology and its role in Child and Adolescent Psychiatry. Topics covered include, but are not limited to Transformational Impact of Health IT on Clinical Practice; Strategies for Leveraging Health Information Technology for Improving Quality of Care; Provider-to-Provider Communication and Coordination of Care; Health Information Technology in Child Psychiatry Education and Training; The Use of Patient Portals, Privacy and Security Issues; Mobile Health Interventions for Psychiatric Conditions in Children; Use of Internet Based and Mobile Health Applications; and the Economic Aspects of Health Information Technology.